Borough Under 11s with the Webb Ellis Trophy. Peterborough Rugby Club youngsters came within touching distance of the World Cup on Tuesday as it came to Rushden in the lead-up to next month’s big event. 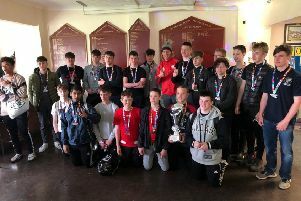 The top clubs in the East Midlands region played in a touch rugby tournament before having the chance to see the famous Webb Ellis Trophy and be photographed alongside it. Borough Under 9s with Dorian West (back centre) and the World Cup. The side that will be the club’s Under 11 team next season won two of their three games, including a victory over East Midlands champions Olney, but, as head coach Simon Potter said: “This wasn’t about results, it was about seeing the magnificent Webb Ellis Trophy and being close enough to touch it. Borough Under 11s will run two boys teams and a girls team next season and would welcome new recruits.especially girls, to join them. Borough Under 9s also attended a tournament where the World Cup was on display. They played in an eight-team tournament against other East Midlands clubs at Althorp House, a stately home where the Spencer family live. The William Webb Ellis Trophy was on display and the Borough youngsters had their picture taken with it along with Northampton Saints coach Dorian West. Borough Under 9s would welcome new players of any ability to go along and give rugby a try at their club. Training starts on Sunday September 6 at 10am at the club in Second Drove, Fengate. For more information call Darren on 07970 296942.